Aftermarket alloy Wheels has been presented above, want more Aftermarket alloy wheel products, please feel free contract me. Aftermarket alloy Wheels is good in quality and competitive in price. We manufacture all our Aftermarket alloy Wheels lines and also can supply according to your requirement. 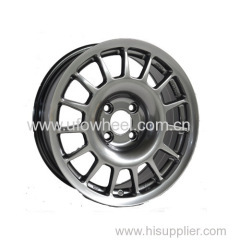 Related replica wheel Category: Aftermarket alloy wheel, Replica PORSCHE Wheels, Replica RANGER ROVER Wheels, Replica VW Wheels, Replica BMW Wheels, Replica Mercedes Benz Wheels. Established in 2005, the UFO WHEEL company specializes in alloy wheels. Through UFO people great work hard, and has got the certificate of JWL, TUV and TS16949. UFO Design offers a wide variety of wheel, including OEM brand wheel and aftermarket wheel, available size from 12" to 26". What Should You Do With The Black Replica Rims? How to Choose Good Audi Alloy Rims? What's the Limit Production Process of Replica Alloy Wheel? What Are the Advantages of Alloy Wheels? How Many Kinds of Process Technologies Made for Forged Steel Wheels? Are 16 Inches Rims the Perfect Rims?